Get up. Drink coffee. Shave, shower, pack lunch, fill coffee travel mug. Get Gnat in car. Drive in traffic for 34 minutes. Drop her off. Head home, listening to Dragnet. (It’s pretty good. It’s better than anything else on the radio. Odd how the show was so “realistic” on the radio and so stilted on TV; Webb just transplanted it whole without realizing that TV required something else, like a camera that moved less than Webb’s arms when he walked.) Get home. Fix lunch. Change. Drive to the office. Get to cubicle. Learn that I’m about to be moved again. Whatever. Sit down. Turn on computer. Cellphone rings. Gnat has pink eye. Leave office. Drive home. Call doctor, make appointment. Shove down lunch. Drive to the other side of town, where the kids are playing at a park. Gnat’s waiting with a bag of ice over her eye. Looks fine; probably a reaction to too much chlorine yesterday with excess scratching. Well, can’t tell. Go home. Put her on sofa for nap. Go upstairs, flip open laptop, type this without knowing quite why. 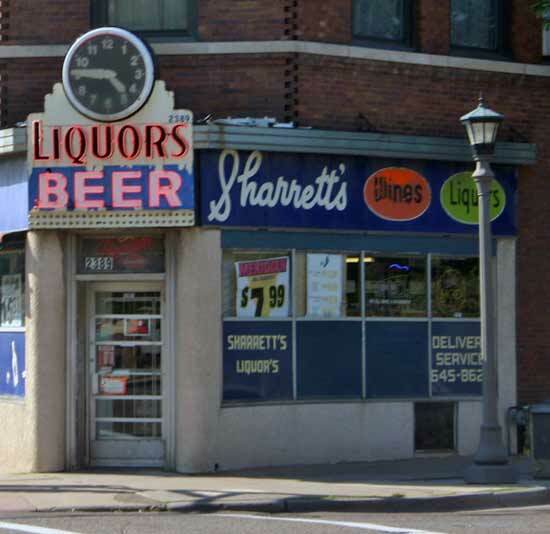 The picture above is a liquor store on University Avenue, a rare glimpse of undistilled Forties signage. I think it goes without saying that if they have LIQUORS they have beer, but I am not the boss of signage. For a liquor store, that clock has so much promise, doesn’t it? The sun is almost over the yardarm; quitting time is nigh. Now off to the doctor’s; if she’s fine, back to the school; if not, then home, then all night doing something because my wife’s at some work-related post-work event. I love it when she uses words like that. So: back to the school for the afternoon class. Unfortunately, everyone was still at the park, so we sat in the empty room and drew pictures for half an hour, drawing a park with flowers and grass and a pond. Then everyone returned and I was off to Costco. What a lovely phrase. Say it! Interfolded delicatessen paper. It just smartly gavottes off the tongue, no? Interfolded delicatessen paper. When I signed up for my card I had my picture taken, and noted to the clerk how I’d let my Sam’s Club membership lapse because the stores were, well, somewhat junkier and less useful. “I don’t go there because of the way they treat their employees,” she said. “But I’m still stuck in the 60s. I don’t order Domino’s pizza, because . . . “ and she let that one go. Like I said yesterday: every day you should learn something that completely invalidates something you held as gospel. Speaking of which – today I learned that the inhabitants of Greenland do, indeed, have 49 words for snow. This and other facts can be gleaned from the rich furrows of Krakatoa, a nonfiction book on history, culture, biology, and plate tectonics. The author’s style is incomparably deft, and the book brims with energetic intelligence. Picked up Gnat, went to the local mall, had supper. The mall was nearly deserted, but there was a knot of giggly teen girls running around shrieking over some boys on the lower level. The gang leader was a stick-thin harsh-faced blonde girl with moxie and lungpower in equal amounts; boy-crazy, I believe the term is. The other girls stood behind her omigodding and tittering. “What’s your name?” she shouted down to the guys below, who were stumped: how can we be indifferent and cool and mumbly now? They’re up there making eye contact with us! What if our pathetic bravado is put to the test tonight, in the parking lot? What if they want to kiss? It was very amusing, especially when the girls zoomed by in one skinny-legged mob and piled shrieking into a photo booth to hide. Gnat found it very amusing, and mocked their giggling. “Teenagers,” she said. But not without a certain amount of awe. More tomorrow – I have to appear on a panel about blogging for a journalist convention, so I should have something interesting to report. And now I’m done.